Beth Marriot is the Server, an unpaid member of the domestic staff at the Dasgupta Institute, a Buddhist Retreat somewhere in England. Beth first went to the Retreat as a Meditator during a personal crisis and has stayed on for a further 8 months. At the beginning of the book Beth’s problems are far from resolved and it takes time for her to reveal the elements of her distress. The immediate cause of her running away from her life as a singer in a band and a number of lovers of both sexes was her self-induced abortion and near drowning, that may or may not have caused the drowning of a boy she had been flirting with. It’s hard to tell whether she is more concerned about the mess that she has made of her own life or the possibility that she might have brought about the death of a young man whom she barely knew. The action of Tim Parks’ latest novel tales place over a single 10-day retreat during which Beth gradually recounts the events that led up to her entering the Institute (but next to nothing about what has occurred in the intervening months) and then enters a new crisis sparked by transgressing rules regarding segregation and reading a diary kept by another of the Meditators/students of Buddhism. Both Beth and the diarist are struggling to follow the Buddhist path to enlightenment and he reminds Beth of one of her former lovers, a man a generation older. His diary, as Beth repeatedly observes, could have been written by Beth herself. There is a circularity here which isn’t entirely comfortable and possibly not very Buddhist either. The middle-aged diarist is too much like Beth’s older lover Jonathan, both men are married and have much younger girlfriends who themselves have partners, two similar triangles. There isn’t a happy relationship in the book, couples are always warring and there are often significant age gaps between them (not just middle-aged men with young girl friends: the diarist-Meditator has a much older wife and Beth makes a move on an older woman at the Retreat). This is a theme that Parks seems to have had in mind before settling to write a novel about tormented and arty westerners trying to turn to Buddhism. There’s a certain amount of humour here but though the stance is sceptical it’s not mocking; Buddhism does and doesn’t help, which may not surprise readers of Parks’ previous book, Teach Us to Sit Still, in which he explored Buddhist meditation while trying to deal with chronic physical pain. 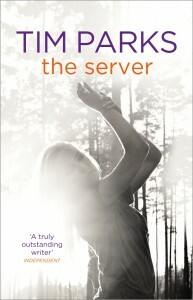 The Server is a well paced and emotionally unchallenging read, despite the various disasters that afflict the main characters (the fate of the boy in the drowning accident is withheld until the end of the book) with various nods and winks at life in the arts – Beth and two of her lovers are musicians; Jonathan, her older lover, is a painter; the diarist-Meditator is a publisher. Jonathan has tried to widen Beth’s cultural horizons and some readers will be amused at the mis-spelled mash-ups she makes of Andrei Tarkovsky’s and Thomas Bernhard’s names. Bernhard was a very present influence in Parks’s novel Europa, Bernhard’s voice was audible in that novel too and whether you find the voice that narrates The Searcher credible as Beth’s is probably the point that will divide those who like this book from those who don’t. Parks has said that The Server is a companion piece to Teach Us to Sit Still but his decision to explore the Buddhist response to suffering through an emotionally and sexually incontinent young woman seems a mistake.